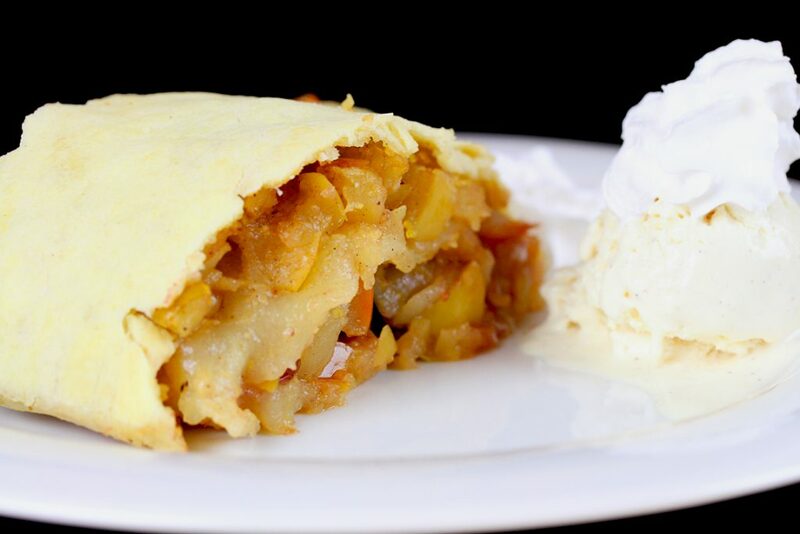 … aaaahhh … fresh, warm, vegan, gluten-free apple strudel served with vegan vanilla ice cream and vegan whipped cream always puts a smile on my face :). I’ve been a bit afraid of baking a strudel with gluten-free flour in the past, but found out that it isn’t that difficult. Maybe the dough cannot be rolled out and stretched that thinly and needs to be handled with extra care, but it’s possible. You might want to experiment a bit with different gluten-free all-purpose flour mixtures to get the best results. However, be careful when rolling out the dough and transferring the filled strudel to the baking sheet. In fact, it is probably best to roll it out on floured parchment paper and transfer the strudel with the parchment paper to the baking sheet. I haven’t tried the usual method of stretching and filling the dough on a piece of cloth, but you can try of course. Depending on how sweet you like it, you can add more or less sugar to the filling. I used xylitol. 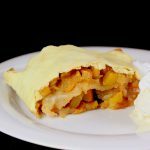 The apple strudel is best served warm with vegan vanilla ice cream or vanilla sauce and whipped cream and you can sprinkle it with confectioner’s sugar if you with. Or simply serve plain :). Combine all dough ingredients and add enough water to make a soft dough. Knead the dough until smooth, form it into a ball, cover with cling wrap and let rest in the fridge for an hour. Place apples in a large bowl, stir in sugar, spices and raisins (or cranberries) and set aside. Brush the dough with half of the melted butter and spread ground almonds / breadcrumbs / corn meal on top. 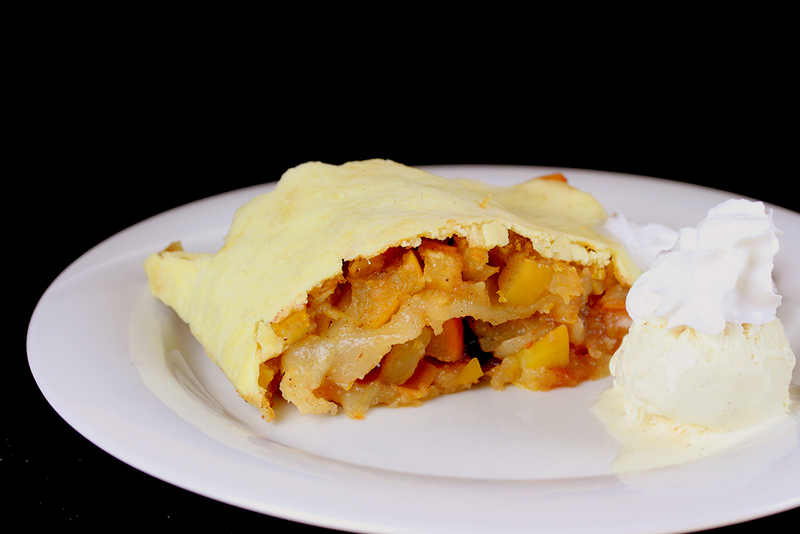 Spread the apple filling evenly over the almonds, leaving a 1 inch edge on all sides. Fold in the sides and roll up the dough. Carefully place the strudel on the prepared baking sheet and brush with the remaining butter. Serve warm with vanilla ice cream and whipped cream.